Whether you have had permanent make-up gone wrong, or are simply tired of your body art, tattoo removal may be a good choice for you. Laser tattoo removal involves using laser light to break pigmented particles into smaller pieces so your body’s immune system can clear them from the skin. 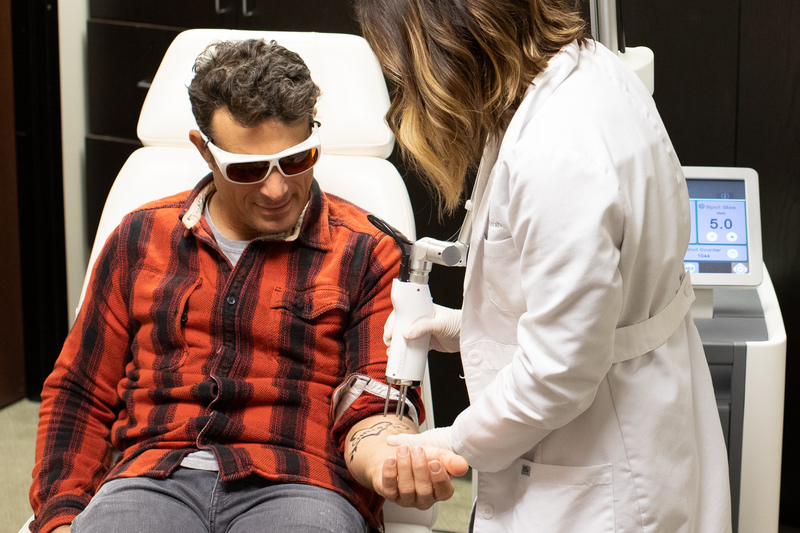 We offer the most advanced laser system for tattoo removal, allowing fewer treatments and superiority over other lasers for removing the difficult green and yellow pigments. It is important to remember that the time required to clear the ink is variable based on the individual and can continue after treatment for a period of several months. Treatments are typically spaced out at 6 – 8 week intervals, but longer spacing is not unreasonable. Most patients require between 5-10 treatments. It is a very customized process, and therefore pricing is not fixed. Price is based on the number of treatments you will need to achieve full removal. Some patients chose to simply lighten their tattoo enough to place a fresh tattoo over the old! The word tattoo, or tattoo in the 18th century, is a loanword from the Samoan word tatau, meaning “to strike”. It is a 6,000 year old practice. 17% of those who have tattoos, regret them. The most often reason for regret is “It’s a name of another person”. 5% of those that don’t like their tattoos decide to cover it with another tattoo instead to remove it. 21% of Americans had one or more tattoos. 36% of 18 and 29 year olds have at least one tattoo. 30% of all college graduates have tattoos. 36% of military veterans and those that currently serve the Army in United States have tattoos. 47% of tattoos require up to 10 sessions to be successfully removed. 26% of tattoos require more than 15. 45 million people spend 1.65 billion dollars a year on tattoos.